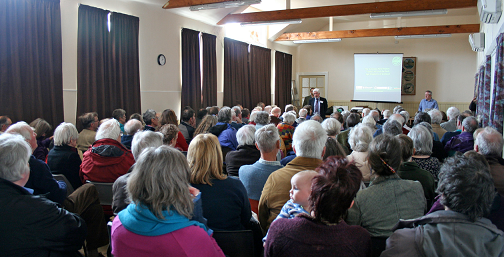 In Dumfriesshire and Galloway Natural History and Antiquarian Society's final lecture of 2012–2013, there was standing room only at Gatehouse of Fleet Community Centre on Saturday, 13 April, when 135 people turned up to hear the results of the Galloway Picts Project. This major archaeological excavation of Trusty's Hillfort, just outside Gatehouse of Fleet, was undertaken by the Society last summer to mark its 150th anniversary. Over a two-week period of glorious weather, the hillfort was excavated with the assistance of professional archaeologists from GUARD Archaeology Ltd and over 60 local and international volunteers. Trusty's Hillfort has always been known to be an unusual site, possessing Pictish carvings cut into the living rock at the entrance to the fort. High definition laser scanning undertaken as part of the excavation showed these to be of a style consistent with the construction of the fort around 600 AD. Remarkably, too, the Society found a rock-cut pool at the fort entrance, eerily similar to Dunadd in Argyll, the known capital of Dal Riada, a contemporary Dark Age Gaelic Kingdom, where an entrance pool and Pictish carvings, again far from the Pictish homeland, are also found. Similar outlier carvings have also been found at Edinburgh Castle Rock, once the capital of another Dark Age Kingdom, that of the Goddodin, the Britons of south-east Scotland. Other exciting finds included recycled Roman Samian pottery and E-ware pottery from post-Roman Empire Gaul; a spinning whorl and an iron pin, probably a cloak pin, with a thistle head almost exactly matching a mould found at Mote of Mark. Was the pin made there? Perhaps the most remarkable find to emerge was what looked at first sight a small thick rusty disc but which turned out to be a beautiful horse harness decoration. There were even traces of leather still on the back! Extensive radiocarbon dating confirmed that the fort was inhabited from the fifth to the late sixth centuries AD, coming to a violent and fiery end around 600 AD, at the time the Northumbrians moved into Galloway and the Kingdom of Rheged disappeared from history. What this excavation has revealed is that Trusty's Hill was a royal stronghold at the heart of the Dark Age Kingdom of Rheged, that was pre-eminent amongst the kingdoms of the north during the late sixth century AD. It was in this kingdom, at Whithorn in the Machars and Kirkmadrine in the Rhinns, that Christianity and literacy is first apparent in Scotland. These sites, along with fortified strongholds like Mote of Mark near Rockcliffe and Trusty's Hill itself, were well connected with continental Europe and the Eastern Mediterranean at a time when much of Britain was isolated, fragmented and barbaric. The evidence from Trusty's Hill indicates that it was perhaps here that the very idea of kingship in Scotland was first developed. Rheged, for so long a lost kingdom, thought to be somewhere in South-west Scotland or North-west England, can now for the first time be fixed to the ground, not in Cumbria or Lancashire or Dumfriesshire, but in Galloway. For there is clear archaeological evidence now for pre-eminent secular and ecclesiastical sites in Galloway during the fifth to early seventh centuries AD, unmatched anywhere else in Scotland and Northern England. said DGNHAS President Francis Toolis. Although the excavation itself is now over, analysis of finds by specialists continues, with fresh discoveries being posted on the project website. In addition, a new leaflet, Discover Dark Age Galloway, has been printed, promoting many of the Dark Age sites that survive in Dumfries and Galloway. The leaflet is free and will soon be available from outlets across the region, such as the Mill of the Fleet, the Whithorn Story Visitor Centre, local museums and tourist information centres. The Galloway Picts Project is supported by the Heritage Lottery Fund, the Dumfriesshire and Galloway Natural History and Antiquarian Society, the Society of Antiquaries of Scotland, the Royal Commission on the Ancient and Historical Monuments of Scotland, GUARD Archaeology Ltd, the Mouswald Trust, the Hunter Archaeological Trust, the Strathmartine Trust Sandeman Award, the Gatehouse Development Initiative and the John Younger Trust.